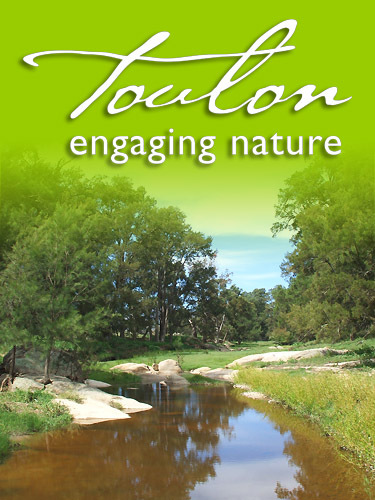 ‘Toulon’ is a third generation family farm situated north east of Bathurst NSW and run by the Inwood family. A superfine merino grazing enterprise is run on just over 800 ha with some opportunity cropping of dual purpose varieties for grazing and grain. This Natural Resource plan is the result of The ‘Farming Systems’ program developed by the Central West Catchment Management Authority (CMA). 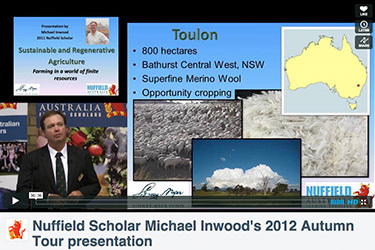 The program is unique in Australia and offers training to selected applicants in order to foster innovative Natural Resource Management plans that address major issues in farming today. This plan was awarded funding as a finalist through the Farming Systems program. The plan aims to 'engage nature' in an innovative approach to Natural Resource Management. Every part of the plan utilises the assistance of nature to help solve pressing environmental, farm management and community concerns. • Fixing our environment. Actual physical repair work on target areas. Active and passive measures are used where intervention is required. e.g. cascading rock gully control structures. • Managing our environment. Grazing management to target levels for ground cover and species composition. Tree wildflower/shrub plantings for biodiversity and shelter. Zero-till ‘No Kill’ Cropping’ and ‘Pasture Cropping’ techniques. • Sustainability in our environment. Zero emission cropping method utilising a 200hp electric powered Mitsubishi Triton 4x4 utility charged by Countrygreen 100% renewable electricity. The electric Triton uses a Hybrid Agrowplow disc drill to allow ‘No-Kill’ and Pasture Cropping techniques. The Natural Resource plan has basic management goals to include building soil organic matter and therefore soil carbon. This is achieved through targeting levels of ground cover, encouraging litter and organic matter through grazing management and appropriate sowing techniques. Water control and utilisation in this plan improve water quality both on farm and downstream in the catchment. The issues of environmental sustainability and carbon emissions have never been more relevant and this project is a successful demonstration of a Private Sector/ Government / Community and Corporate Sector partnership which addresses these issues. The bigger picture of communicating Natural Resource Management and future sustainability has benefited from this whole of community approach. For an overview of resources and possible incentive funding for Natural Resource Management. Where possible the lowest cost natural solutions are employed. There are some expenses in assisting nature to affect the desired result but in all cases these are less than an outright full on assault in remediation terms. The processes will be simple e.g. fence out or limit water flow, but the range of issues nature will bring into play will be extremely complex. The aim will be to have a highly resilient, robust, organic, replicable system capable of withstanding the extremes of climate variability that are forecast, and that we have been subject to recently. Alternative sustainable energy is also a central theme. Solar power is central to the themes within this project. – Country Energy’s countrygreen® 100% renewable electricity powers the farm. 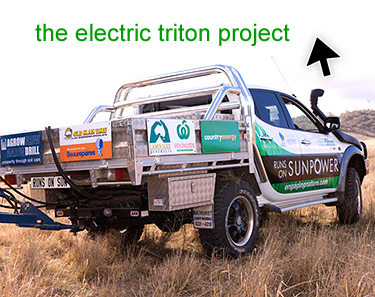 – SunPower® solar panels generate the power to run the electric Mitsubishi Triton, in all of its farm activities, and also pump water for stock. – Grid Connect. All electric power drawn from the grid is GreenPower™ accredited renewable energy from Country Energy. Surplus farm solar power is fed back to the grid. In this way the grid is a two-way energy bank. Powered by Essential Energy. Sponsored by Woolworths.